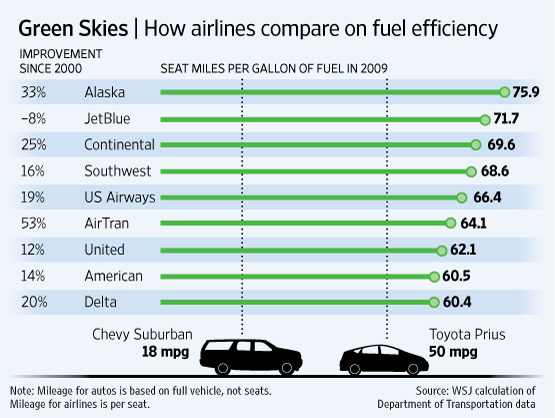 The Wall Street Journal used a per seat figure for airplanes but a vehicle MPG for cars. 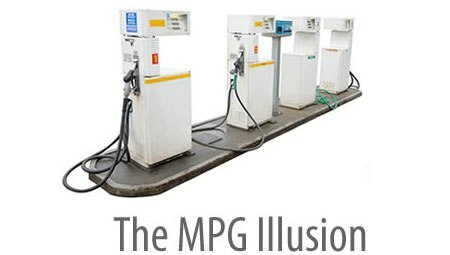 Thus, these airplane MPGs assume a full plane--if the plane were only 80% full (a number reported recently by JetBlue and by Continental), the real MPG per passenger would be reduced by 20%. The car MPGs shown above assume 1 occupant (the driver). Once you add 4 people to the Prius, the equivalent per passenger MPG is 200. And 6 people in the Suburban gets you to 108 MPG--far superior to the airplanes. A counterintuitive implication is that, for long trips, families may use less fuel driving a low MPG car than flying together. Of course, if the family owns a Prius, the margin in favor of the car is huge. I always have conflicting hopes when I board a plane. I love having an empty seat next to me, but I also want a full plane to boost the MPG. But if the plane is too full, I start thinking about the fact that increased demand (in the aggregate over many flights) will lead the airline to schedule more flights. This does not take into account the issue of marginal versus average carbon emissions. In other words, you could argue that the plane flies anyway, no matter if you are on it or not. Looked at it from this angle, adding one more person to the plane will only very marginally increase the amount of fuel the plane uses. From this view, it is always better to fly than to drive, because you'll avoid the emissions from your car. Yet this argument is flawed. Planes only fly because there are people who want to get to places. During the Y2K scare around the turn of this century, hundreds of flights were canceled, because people chose not to fly. The consumer drives the supply. We can't all be the marginal passenger and "fly for free." It makes sense to focus on per seat MPG and then shrink by the unoccupied seats. Truecostblog.com analyzes different modes of transportation adjusted for average occupancy--airplanes and cars end up remarkably close given average occupancy rates. What does the future hold for airplane MPG? Recent history has shown a steady improvement in efficiency (due in part, of course, to competitive pressures and high jet fuel prices). What countries account for the most airplane fuel use? This video is quite revealing. Look to the skies--they tell the story.